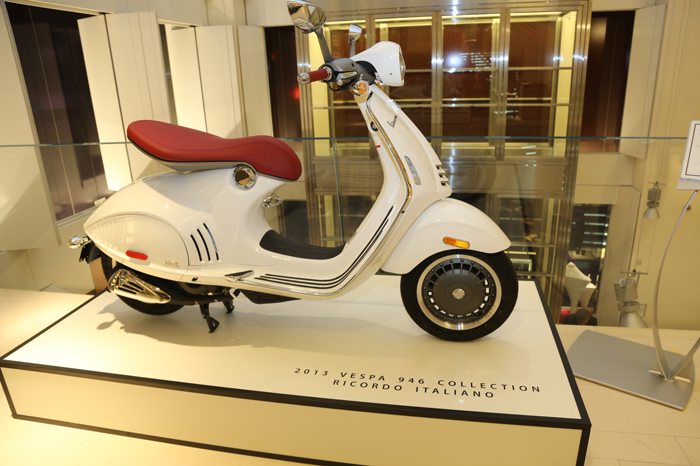 Piaggio debuted the Vespa 946 in North America, a few days ago, on October 25, 2013. The presentation took place in New York, at one of Manhattan's most exclusive shops, the Bulgari flagship store on 5th Avenue. As of October 25th, the 946 is available in the USA for a price of $9,946. The Vespa 946 2013 edition will consist of only 3,600 scooters worldwide, so it is definitely a limited edition scooter. In fact, the production of the 2013 lot in the Pontedera factory in Tuscany, Italy, will be terminated in November of 2013. 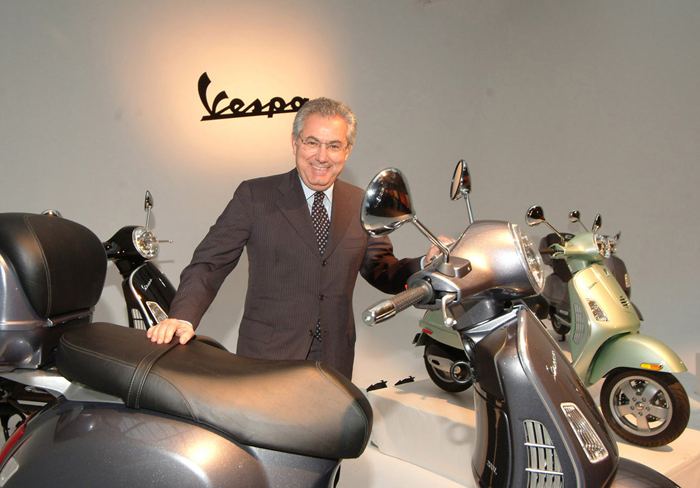 At the event, Piaggio Group Chairman and CEO Robert Colaninno said, "2013 has been a remarkable year for Vespa. The 946, an exclusive and elite product, is about to be joined by a completely new model to be launched at the EICMA motor show in Milan in early November. Given the style content of this second scooter, we've decided to give it a legendary name, one of the most significant in the history of the world's most famous scooter: Vespa Primavera." Mr. Colaninno also stated, "The introduction of new models, all of them faithful to the original Vespa design, but implementing innovative style and technology, and the development of new industrial and commercial initiatives around the world are the secret of this exceptional brand's growing success over the years." Piaggio Group worldwide Vespa sales in the first nine months of 2013 totalled more than 146,600 scooters, an increase of 21.3% from the 120,900 two-wheelers sold from January to September 2012. These figures are further confirmation of the extraordinary progress of the Vespa: from 2004, when sales totalled 58,000 scooters, the brand has grown to 100,000 shipments in 2006, 122,000 in 2009 and 165,000 Vespa scooters produced in 2012, a record that is about to be broken in 2013. In the USA, marketing of the Vespa 946 will enhance the offer of the Piaggio Group Americas division, which, from its head office in New York, markets all the Piaggio Group brands in North, Central and South America. A benchmark player on the US scooter market with a 23.1% share, rising to 36.5% in the over 50cc segment, in the first nine months of 2013 Piaggio Group Americas reported aggregate sales for the Group brands of more than 13,300 vehicles in North America and South America, an improvement of 7.7% from the first nine months of 2012. Besides its sales division, in the USA the Piaggio Group also has an R&D centre, set up on the West Coast in 2012. The Piaggio Group Advanced Design Centre in Pasadena (California) operates closely with the Piaggio Group Style Centre in Pontedera and the Group R&D centres in Italy, China, India and Vietnam. Its mission is not only to work at the cutting edge of design, but also to follow key research projects in urban mobility technology, with a special focus on engines with low or zero emissions and use of alternative forms of energy. The international development of the Piaggio Group’s industrial, commercial and research operations is at the basis of the important award Roberto Colaninno received in Washington DC at the 38th Anniversary Gala of the National Italian American Foundation (NIAF), on October 26, 2013. The Piaggio Group Chairman and CEO was one of the Italian and Italo-American honorees at the ceremony organised in the US capital – where other recipients included the former CIA director and US Defence Secretary Leon Panetta – where he received the “NIAF Special Achievement Award in International Business”. - Information for this article was obtained from Piaggio Group's online press release. PLEASE HELP FUND "THE SCOOTER DIARIES"!